The Torah, “Leviticus”, 23:29 – 23:32: For any person who will not be afflicted on that very day, shall be cut off from its people. And any person who performs any work on that very day I will destroy that person from amidst its people. You shall not perform any work. [This is] an eternal statute throughout your generations in all your dwelling places. It is a complete day of rest for you, and you shall afflict yourselves. On the ninth of the month in the evening, from evening to evening, you shall observe your rest day. Because the day begins in the evening, the Torah commands us to observe Yom Kippur by resting from one evening to the next. If a person comes close to a state of atonement and forgiveness, clarifies, and feels it correctly, he totally refuses to do anything on that day because all his actions will stem from his finite ego. A person who has not yet decided and tries to do something hinders his advancement and corrupts his soul. Therefore it says: For any person who will not be afflicted on that very day [Yom Kippur], shall be cut off from its people, because the desire with which a person could have begun his ascent is gone and is concealed from him. Only if he performs many different actions will he be able to get another chance to feel and understand it. These actions help him return to the same state, but with a different clarification that is deeper, more correct, and helps him go through this state properly. But he prolongs his path this way. Have you ever asked yourself why you fast? Why you go to the synagogue on Yom Kippur? Why you wear white? Why you ask for the forgiveness of a friend you have wronged? To be honest with ourselves, the reason is that on Yom Kippur we all want to be “not guilty” at least in something. Those who are well-off even compete as to the sum they pay for the right to read the Book of Jonah in public, a well known merit for wealth and success in business in the following year. But do they understand what they pay for? Jonah’s story begins with a mission that he receives from God to warn the people of Nineveh that they should repent and change the unfounded hatred they feel towards one another to brotherly love. Today, the nation of Israel also has a mission, just like Jonah, that we cannot run away from. It is the same mission we have had since the days of Babylon, since the time Abraham united us on the basis of love of others, so that our unity will be an example for the whole world. Fulfilling this role is our right to exist. We have experienced how this law of nature operates throughout history: when we are united, we prosper and the world prospers too. When we fall to unfounded hatred we suffer from blows and the world deteriorates. We have failed to establish the connection between us to such an extent that we don’t believe we can ever establish good relations among us. We are filled with aversion when we hear about our mission of being Light unto the nations. We have forgotten our mission and when we escape from it, the storm comes. Jonah runs away from his mission and escapes to a ship sailing overseas. His escape causes a storm, and the sailors understand that the reason for their suffering is the Jew who is on board their ship. It doesn’t take long before they throw him overboard. In the modern global world, the nations of the world also blame us for every crisis there is. The fate of the Israeli nation is inevitable. The sailors in the story change each time but our fate is the same. If we don’t wake up and agree to fulfill our mission, the time will come and we will be thrown into the sea. Jonah is thrown to the bottom of the sea and is swallowed by a whale. When he completes his soul searching he agrees to fulfill the mission he has been given and only then does the fish brings him to a safe shore, to Nineveh. Just like Jonah, we too carry the method for connection. This national gene binds us into one nation and we cannot escape it. When we connect, we will set an example of unity for all the other nations. The only question is whether we will fulfill the responsibility that we have or whether, God forbid, we will be thrown into the depths of the sea so that we will agree to fulfill our role. Our role is to turn the unfounded hatred we feel into love of one another. But instead of being Light unto the nations ,we do everything in our power to be like all the other nations. The steamroller of evolution, however, is making more and more people and countries feel subconsciously that the Jews are responsible for all the impending troubles, so the nations of the world will not change their attitude towards us for the better unless we fulfill our obligation. Yom Kippur, which is a time of deep soul searching, is an opportunity to accept our mission and to decide to connect and become the Light unto the nations. Only then will the global turmoil around us calm down and all of humanity will reach peace and quiet and a Sukkah of peace will be spread over all of us. A happy new year and may you all be signed and sealed in the book of life. Yom Kippur: Universal Joy Or Grief? The Torah, “Leviticus”, 23:26 – 23:28: And the Lord spoke to Moses, saying: But on the tenth of this seventh month, it is a day of atonement, it shall be a holy occasion for you; you shall afflict yourselves, and you shall offer up a fire offering to the Lord. You shall not perform any work on that very day, for it is a day of atonement, for you to gain atonement before the Lord, your God. The counting of the months in the spiritual work begins in Pesach (Passover). The seventh month from Pesach correlates to Malchut, to the seventh Sefira that comes after Hesed, Gevura, Tifferet, Netzach, Hod, and Yesod. The tenth and last Sefira in Malchut (Malchut of Malchut), which symbolizes the tenth day of the month, is Yom Kippur, when a person comes to the lowest point of his nature and raises his prayer from it. This means that a person reaches a state that isn’t in his power to correct by himself, so he simply detaches himself and does whatever is in his power to raise a request for correction. Yom Kippur is a holiday. It is a day of joy, when I have something to turn with and someone to turn to (the upper force) with this request. I can actually do that since I have reached the lowest point by my actions. In other words, I have reached the very last state through my clarifications and internal psychological searching for who I am, what I am, towards what my actions are aimed, and what am I living for. I have discovered that it is totally egoistic and that there is no connection with others within this state. At this point I can only cry out, and this is a point of atonement and forgiveness where I feel my nature as the hateful ego and I wish to detach myself from it with all my might. I don’t want to use the ego when it comes to food, water, or in any actions, and I cannot overcome it. The only thing I can do is raise a prayer to the upper force so that He will correct me. This is the meaning of my request. We can reach a state of atonement and forgiveness any time, regardless of the calendar date of Yom Kippur. It happens when the upper force can perform corrections on me. Only He can help me; I cannot correct myself, but I can ask Him for this correction. Comment: Everything that happens in the spiritual world is opposite from whatever there is in the corporeal world, because for us, Yom Kippur is a day of universal grief and not a day of joy. Answer: In the past, the state of Yom Kippur was understood correctly, but during the 2,000 years of exile, we have attributed it to our own feelings and have matched our feelings with this day. In fact, it is a state of joy because all the holidays are joyful. The Torah, “Numbers,” 15:22 – 15:25: And if you should err and not fulfill all these commandments, which the Lord spoke to Moses. All that the Lord commanded you through Moses, from the day on which the Lord commanded and from then on, for all generations. If because of the eyes of the congregation it was committed inadvertently, the entire congregation shall prepare a young bull as a burnt-offering for a pleasing fragrance for the Lord, with its prescribed meal offering and libation, and one young he-goat for a sin-offering. The Cohen shall atone on behalf of the entire congregation of the children of Israel, and it shall be forgiven them, for it was an error, and they have brought their offering, before the Lord because of their error. There are errors a person makes unknowingly because he doesn’t feel them. He doesn’t feel or doesn’t understand that he is doing something wrong, and thus unintentionally becomes partner to or even the source of a corrupt state. But these extenuating circumstances do not change the outcomes, and there is no turning back. But there are errors that are actually sins because a person knows that he is breaking a certain rule or prohibition. The fact that a person consciously causes society and the whole system of providence harm doesn’t stop him. Moreover, in both cases there are different levels of errors and this is the reason that there are many additional items in the laws in our world that take different circumstances into account. The opinion of the jury who examines a specific transgression, and thus decides what legal item to attribute it to, is also taken into account. These are very delicate matters that are part of a person’s inner world and cannot be decided without people’s intervention. It is impossible to feed these data into a computer and let it decide who is guilty and who is not. Human participation is crucial here. The Jewish holidays are far beyond just observing traditions. They are interlaced with the present time much closer than we think. Jewish holidays are a trajectory of the nation’s destiny, a cardiogram of our common heartbeat. Jewish holidays’ symbols convey the information that otherwise would be lost in the impenetrable labyrinths of history or distorted beyond recognition. The importance of the Jewish holidays extends far beyond! Our holidays deliver messages not only about our past but also our future. The first of the fall Jewish holidays, Rosh HaShanah (the head of the year), is the Jewish New Year. It denotes spiritual awakening. It appeared the moment people sensed an aspiration to things that are beyond their everyday routine. The name of the first human being is Adam. He was the first one who ever thought about the meaning of life. The day Adam realized his strong desire to know what his purpose in life was is marked in the Jewish calendar as Rosh HaShanah. It is quite possible that it is the only event in ancient history for which the exact date is known. It happened on the 1st of Tishrei (September-October), 5776 years ago. Since then, Rosh HaShanah is not just a day on the calendar; rather, it is a developmental milestone. On this day we give an honest report to ourselves about how we lived and what we were supposed to reach during the previous year, and the coming judgment. Today, when the entire world is overwhelmed with a new wave of anti-Semitism, it is essential to understand what awaits us in the future. As never before, it is crucial to once and for all break this spiral of centuries of exile and unbearable sufferings that accompanied the Jewish people throughout history. The prophet Jonah’s story is always read on Yom Kippur (the Day of Atonement). It helps us better understand the situation we are in now. We’ll get to this story a little later. 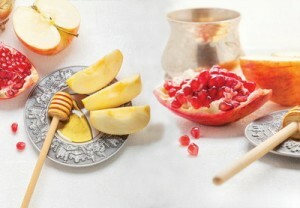 Rosh HaShanah symbolizes our aspiration to upper values, benevolent existence, sharing with and caring for each other. This is why there is a tradition to eat fish heads. It symbolizes our inclination to stand at the head of all positive changes. Pomegranate with its many juicy seeds reminds that we are also like “seeds” and that it is high time for us to “ripen.” Our unity should result from our joint efforts. It will give us a qualitatively new boost. We dip apple slices, an ancient symbol of “transgressions,” meaning detachment among us, in honey to “sweeten” (correct) the lack of unity among us. How can we achieve this unity not out of fear, troubles, or despair, and sincerely desire to get closer to each other? How can we feel like we all are one family not only during wars that force us to involuntarily keep together, but also in the time of peace? For that, each one of us has to rise above our own self-interest to balance our fragmented nature by aspiring to establish positive, good relations between us. This is exactly what Kabbalists mean when it gets to description of the Jewish holidays. Yom Kippur comes after Rosh HaShanah, and for the Jews this is the most sacred day of the year. On this day we fast and pray. And the main part of the prayer is the reading in the book of the prophet Jonah. In fact, the code for the salvation of humanity is concealed in this book, even though the plot of the narrative resembles an adventure novel. In his time, the patriarch Abraham realized this idea and established the Jewish people on its basis. How he achieved this is a separate subject in itself. Now something else is important: the Jewish people succeeded in doing something that, in principle, is impossible. Today, more than ever, not only the Jews and Arabs, Russians and Americans, but the entire world requires, if not love, then at least, an elementary mutual understanding. But today, as in the past, similar ideas are unequivocally accepted as completely impractical. 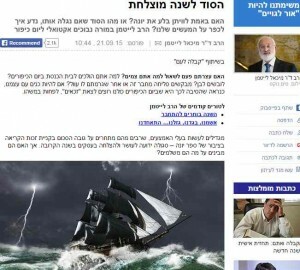 So it is not surprising that Jonah decided to escape across the sea. It seemed to him that in this way he could shirk the task that was imposed upon him. We too, like Jonah, sometimes try to take refuge in the daily routine from the big “impregnable” problems.” Others will deal with them and we will deal with ours. But from time immemorial, a reminder comes that there is a special mission for the Jews, and it is impossible to escape it. The ship upon which Jonah sailed was caught in a violent storm. The sailors worked hard to survive: They threw everything that was not necessary overboard, prayed to their gods, and understandably they began to search for who was to blame. And Jonah, meanwhile, goes to sleep, as if everything happening didn’t concern him. Only then, having no choice, he admitted that he had fled from the task that was imposed upon him and asked the sailors to throw him into the sea. This means that Jonah was even ready to die, just so he wouldn’t have to carry out what he was assigned. But even this didn’t help. A gigantic fish swallowed the fugitive, and three days in the belly of the fish forced him to agree to carry out the established task. Today, when the world has become a “global village,” all of us are apparently sailing in one boat on a stormy sea, and the nations of the world, the “sailors,” blame all the crises, wars, troubles and disasters on the “only Jew” onboard, the Jewish people. But we are still sleeping, like Jonah. Immersed in daily business, trying not to notice that the nations of the world hate us more and more; we hope that everything will somehow calm down by itself. But every new wave of anti-Semitism shows more clearly that our fate is as unavoidable as was the fate of that fugitive due to whom the storm broke out. And if the crew of the boat first tried to save Jonah, today, “The sailors of the world ship” are just waiting for the right moment to throw us into the sea. We don’t even need to ask this “favor” of them. The Jewish holidays are more than just history. The Kabbalists established them in their time and through the symbols of the holidays they conveyed their message to us, their descendants. The message directly touches upon the fate of the Jewish people. Rosh HaShanah points to the need for the desire for higher values and the establishment of good human relationships. Yom Kippur reminds us that escape from carrying out this role cannot continue forever. In any case, we must acquire these values and pass all of this on to the other peoples, even if, like Jonah, we don’t want this. We see today how hatred between people and between nations, pollutes our planet more and more. Everything we do, from new technology to social revolution, ultimately leads to a new disaster and makes the hostility between people more acute. This problem can be solved only with the help of the Jewish people. After all, the idea of unity, equality, and mutual guarantee (Arvut) is its foundation. The people who followed Abraham lived according to the law of love, with a feeling of closeness to each other. The world is not waiting for scientific discoveries or achievements in literature and art from the Jews, the world is waiting for the Jewish people to reach unity, and by providing an example for the rest of the nations, the method of Abraham will be transmitted to them. And this will bring peace and tranquility to all peoples, which will free the Jews from anti-Semitism and will put an end to all their troubles. All nations of the world celebrate the new year as an ordinary earthy holiday. It is only special for Jews. We celebrate the creation of Adam. This is a very significant date. The world was created five days prior to the New Year (Rosh HaShanah). Adam was created on the day of the New Year, the fifth hour of the onset of Friday. All significant dates of the Jewish calendar do not designate material holidays, but rather various spiritual deeds, including the creation of the world and the creation of Adam. They were the ones that gave our people the general direction of advancement to the goal. Adam is the soul, meaning it is a power structure, a network of forces that supposedly exists somewhere in space and represents the analog of the Creator. It was created from above by the upper force—the force of goodness, love, and bestowal. Therefore, the structure itself is in the same state of bestowal, love, and mercy toward itself, and it is an internal and self-contained “cocoon” that existed on its own; it did not have a need to develop. In order to force this structure to develop, there was a need to shake it up somehow, to introduce an element of interference, sharp external influences. This was done with the help of the additional system called Chavah or Eve. It shifted the inner balance of Adam and as a result this structure ruptured from inside. For example, when there is an imbalance in the atomic bomb as a result of excessive rapprochement between the two halves, the critical mass is increased and it begins to self-destruct, which leads to a nuclear explosion. The same happened here. It turns out that we celebrate the fall. One would say that we should be mourning, fasting, weeping, and covering our heads with ashes. Not at all, we celebrate because this breakage allows us to assemble ourselves from the pieces of Adam and Eve and come to the state similar to the upper force that created them, and we can become equal to the upper force in perfection and eternity. So we correct what the Creator purposefully broke for us, similar to how parents disassemble a puzzle for their child so he would get smarter while putting it together. Throughout this action it is necessary to see the Creator prepared this for us and is treating us with love, wanting us to reach His perfection, become equal to Him. This is why we celebrate this opportunity given to us as a holiday. This is the New Year.